So, Dad gets a little obsessive about cleaning his bike, huh? Then give him this selection of S100 cleaning products. 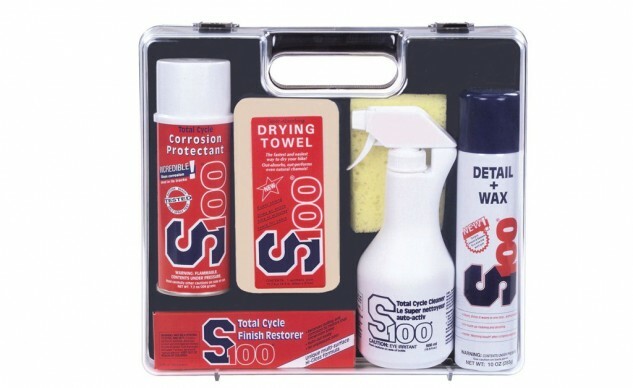 The S100 Care Set contains five top-selling S100 bike care products all packaged in an easy-to-carry container. Whether Dad rides a cruiser, a sportbike, a tourer, or a vintage machine, the S100 Care Set will have the right products for his cleaning needs. The 16.9-oz. S100 Total Cycle Cleaner is the product that first brought S100 to fame for its spray on and rinse off cleaning. Tougher challenges get specific products. The S100 Finish Restorer which can renew tarnished metals (aluminum, stainless, chrome etc.) to the desired level of shine and can even work magic on plastic. S100 Detail and Wax is ideal for spot cleanup of bugs and road mung. The S100 Corrosion Protectant saves metals prone to corrosion by sealing the surface. The Super Absorbing Drying Towel will dry Dad’s bike to a spot-free shine while never getting stiff the way that chamois can.